Set well back from the road, within Waikoloa Beach Resort yet very much apart from it, gates ensure your privacy. You’ll be near shops, restaurants and entertainment, but with the amenities of this home you may choose to remain on the property. If you enjoy cooking, you’ll love the professional-grade kitchen (as will any of the local personal chefs available to serve your needs). Swim in the infinity pool, luxuriate in the spa tub, relax in the teahouse, explore the ocean shore by day. Celebrate sunset over the Pacific with an intimate gathering in the second-story Whale Watch Tower with panoramic views that sweep from the Kohala Mountains, across the ocean and Maui and further along past the resort and ponds and up to Mauna Loa and Mauna Kea. After sunset, the stadium theater with six reclining lounge chairs will keep you entertained. A short way from the privacy gate, via a roundabout, brings you to the circular drive fronting this home. A trellised entrance with tropical plantings leads to a massive front door encircled by sidelights and clerestory windows. Entering the Great Room, you’ll find the 12-foot ceilings and modern beach décor of tile, mahogany and granite with subtle colors that run throughout the home. Furniture was custom-made on the Big Island, with additional pieces acquired from B&B Italia and Design Within Reach. Original artwork punctuates the uniqueness of Pacific Sunset Villa. A graceful curved ceiling and exposed-beam peaked tray ceiling define dining and sitting areas. Family television area, beverage bar, and kitchen/breakfast bar complete this room. 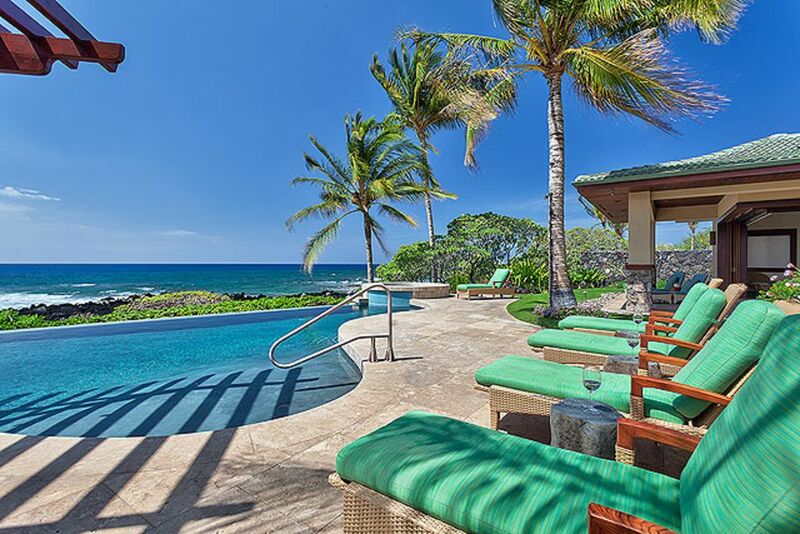 The entire front of the Great Room is opened by motorized glass pocket doors, leading to the “great outdoors”: lanai, infinity pool and spa tub, koi pond and waterfall, trellis and suspended wooden walkways to the private tea house, and—of course—the ocean. One of the highlights of this home is the second-story Whale Watch Tower, an intimate space constructed for privacy as well as spectacular views. With a bar and small refrigerator, table and chairs, you’ll enjoy small parties here. With a full-size punee (daybed), you’ll enjoy an afternoon nap or an evening of stargazing. In the hallway from the Great Room to the Master Bedroom suite, you’ll find an inset wall display with a large glass sculpture of a sailboat. Sliding-glass doors along two walls lead to the lanai and ensure terrific views. This master suite has shower/steam room, mirrored dual-sink vanity area and walk-in dressing room. The second master suite is on the opposite side of the house and has a glass slider leading to the lanai, walk-in closet plus a full two-person walk-in shower, tub and double sink and private toilet. The two guest suites are set apart by a trellised courtyard complete with rock garden and majestic brass fountain by award-winning artist Archie Held. Each suite has a queen-size bed, wall-mounted flat-screen television, walk-in shower, tub and private toilet. These suites overlook the anchialine ponds. In home theater & media room with recliner stadium seating for six, Gourmet Kitchen, Breakfast and Entertainment Bar, Koi pond, Outdoor dining, Whale Watch Tower. Kayaks and bicycles for two are provided with this rental. This is a home designed to capture every feature of The Big Island. Sweeping views inland and to the western sky blue sea. The zen of gazing out from the infinity edged pool seamlessly into the endless ocean. The non-stop sounds of an assortment of island birds, and the seas slapping against the lava rock coast. The interior of the home opens to the sea from every room. Beautiful custom art is carefully placed around the home, making every view special. You'll be back soon - we were. Wow! This property is stunning, and exceeded my expectations. Pictures just don't do it justice. The sun sets over the infinity pool, as you enjoy dinner in the outdoor dining room. Every conceivable amenity is available, including an ice maker wherever you might think of making a tropical margarita! The ocean front home is quite private, yet is located within walking distance from great shopping, good restaurants, golf courses, and two resort hotels. It does not get any better than this! This home is simply the most beautiful home and setting we've experienced. From the first impressions to the last detail, every part of our time here was beyond any of our expectations. The pictures obviously do the property some justice, but upon arriving (with a warm greeting and a cold drink from the property manager) we were blown away! It leaves quite a dramatic impression to walk through the front door and see the beauty of the home and, beyond it, the stunning view of patio, infinity pool, palm trees and the ocean. We found the furnishings tasteful, simply elegant, and comfortable. The kitchen is a chef's dream. The bedrooms suites afforded the utmost privacy for our large family. The theater was a huge bonus for us. And the outside living space was stunning. There is nothing I would change. This house is IT! This property exceeded our expectations and we thoroughly enjoyed our week here. It was a home away from home with everything we could possibly need and more. It was a nice walk from the grocery store, and we really didn't need to leave the property other than to get groceries. It was quiet and private, which we appreciate in a holiday, and probably the most relaxing holiday we have experienced. Any questions were quickly answered by the property manager, although the instructions were all very precise and straight-forward. We would certainly recommend this place to anyone travelling to the big island! talk about the "WOW FACTOR" ... this is it! there are not nearly enough stars for me to click in response to this property. it has completely ruined me for any other hawaii property. "beautiful," "peaceful," "refreshing," "spectacular," "calming," "inspiring," ... i'm running out of words, yet none of them quite captures the power of this place. i can't wait to go back. do yourself a favor and rent this home! what more can i say? i'm hooked. This home is truly magnificent and luxurious. Situated on the ocean’s edge, it provides privacy in which to enjoy the beautiful ocean scenery as well as breath-taking sunsets. However, its proximity to shopping (Starbuck’s, grocery store, unique shops, golf, etc.) makes it a perfect location for an amazing vacation. The home itself is majestic with palatial bedrooms and state-of-the art fixtures. The kitchen is a chef’s dream complete with every possible utensil, gadget, and tool. The décor is splendid and perfect and so inviting! Our time spent in this stunning home was nothing less than perfect and we look forward to our next trip!